We do not always have pups for sale, particularly not during our Winter months. Here in Manitoba, it is not unusual to have temperatures 40 below (Fahrenheit and Celsius) for 2-3 week stretches. 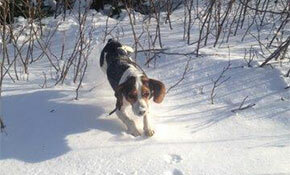 Our pups are mostly ready to go to their new environments starting in the Spring, through till about July. We have decided to part with some of our outstanding females at this time. Whether you are looking for a good gundog or trial dog, contact us. We will try our best to find you a female that will suit your particular circumstance. Some running, younger dogs may also become available. This is Max, now getting a bit older, although still running 5-10 km several times a week with his owners. Auggie with her owner Helen, in a non-hunting rather tracking/obedience event. 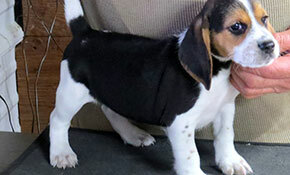 Auggie and Helen have a superior partnership, showing beagles can do anything asked of them, when handled right.